The Egg Foot (エッグフット Eggufutto) is the third boss of Sonic Advance 3, and is fought in Ocean Base's boss Act. 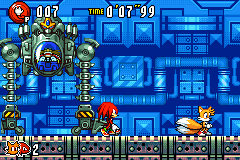 Eggman utilizes a frog-like machine that is similar to the Egg Frog in design, but has completely different strategy and has Gemerl stationed above the cockpit. The machine leaps up, its legs being the only thing visible upon leaving the screen, and moves back and forth across the screen, before stopping and dropping back to the ground, attempting to squash the characters. The only way to attack this boss is to be right between both legs as the machine drops and nail Eggman in his cockpit. Take note, however, that after a few hits Eggman will occasionally pull the "feet" of the mech inward, blocking the opening for attack & creating a shockwave across the ground (he is especially prone to doing this during the "Pinch" portion of the fight). The machine will explode after 8 hits (6 on Easy), forcing the fat man and Gizoid to retreat and allowing the heroes to advance to the colorful Toy Kingdom. This page was last edited on 15 December 2017, at 18:07.